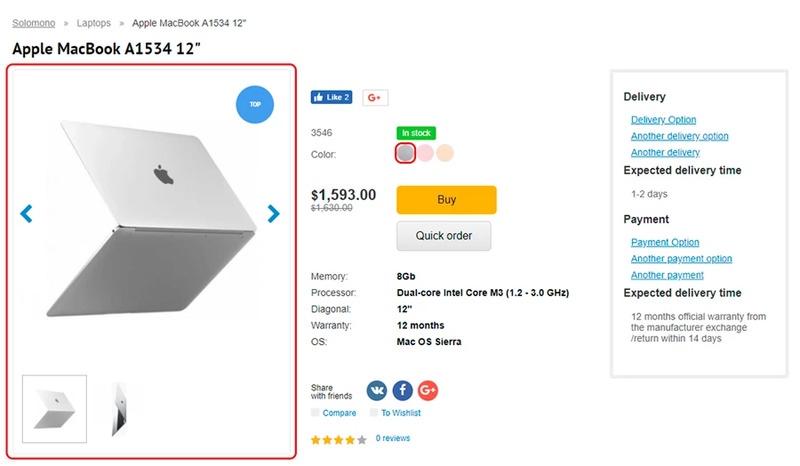 Before you add a new product, you need to think over the structure of your site. 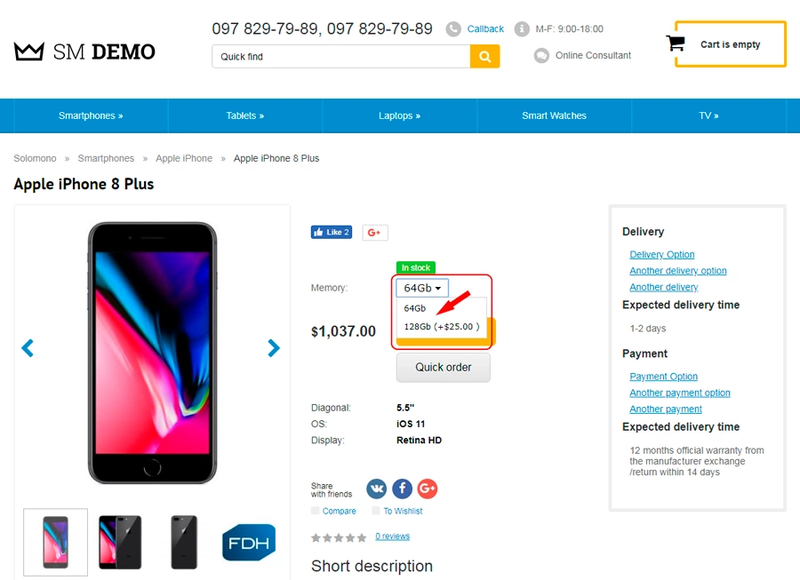 For example, there is a category "Smartphones", it may contain phones of different manufacturers Apple iPhone, Samsung, Meizu, etc., but in the category of manufacturers it is necessary to add the product itself. 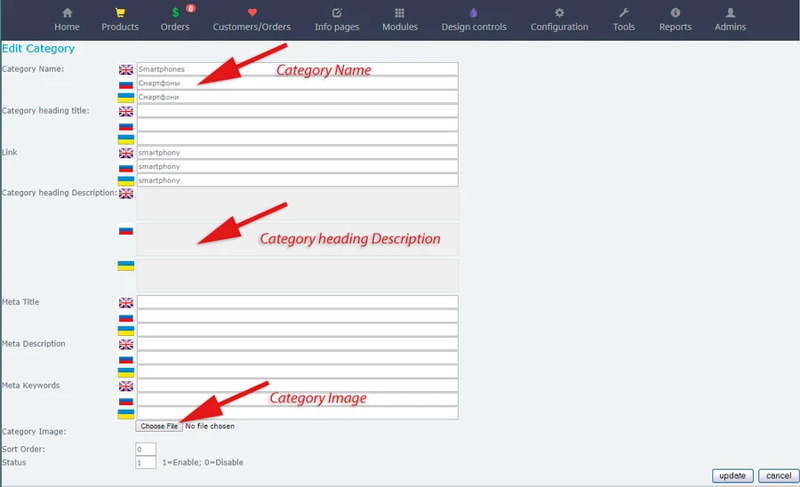 So, go to the category "Products / Catalogue" and click "New category"
Here we give the name of our "Category" in the languages ​​that are available, as here it is possible to add information and picture of this category. Important: Do not forget to fill in the "Meta Description"
Push the "Add" button and we have the category "Smartphones"
So, the first steps are made, go ahead. 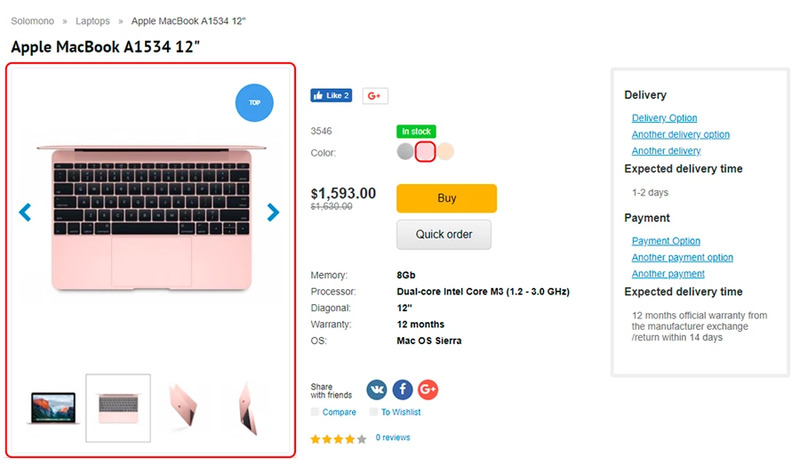 Next we go to the category "Products / Smartphones / Apple iPhone" and create a "new product"
So we are in the product card, here we need to, keep the data: "Products Name", "Short Description ", "Products Description", "Price", "Products Model" (if necessary), etc. In order to save the entered information, we press the button "insert". Next, we select the file (picture) and click "Upload". Also, you can simply drag the picture from the folder to the "gray window". When you have downloaded all the pictures, click "Update". You can upload as many pictures as you need. In order to return to the previous category, you need to click the "Back" button. The first steps to add goods to the catalog are completed. 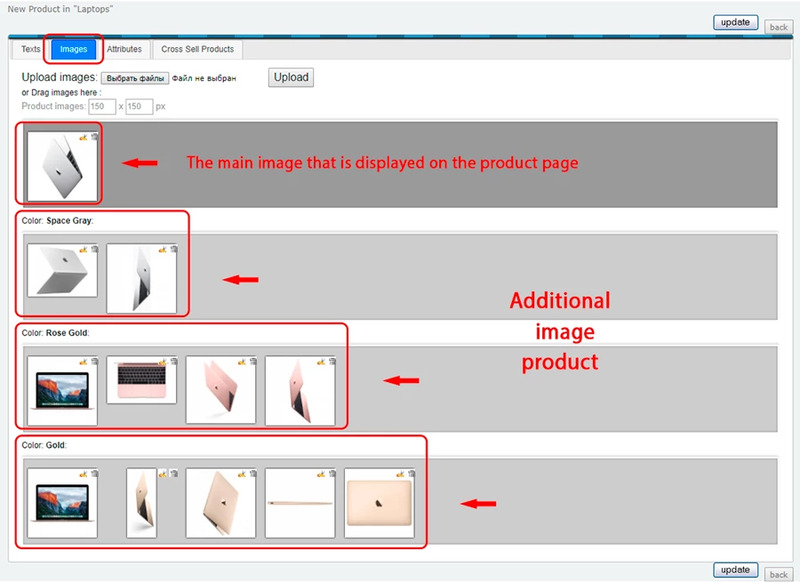 Suppose there is a need to change the location of the folder with the goods or move the entire folder of goods to another folder. To do this, go to the category "Products / Catalogue" and opposite the folder that you want to transfer, press the "Move" button. 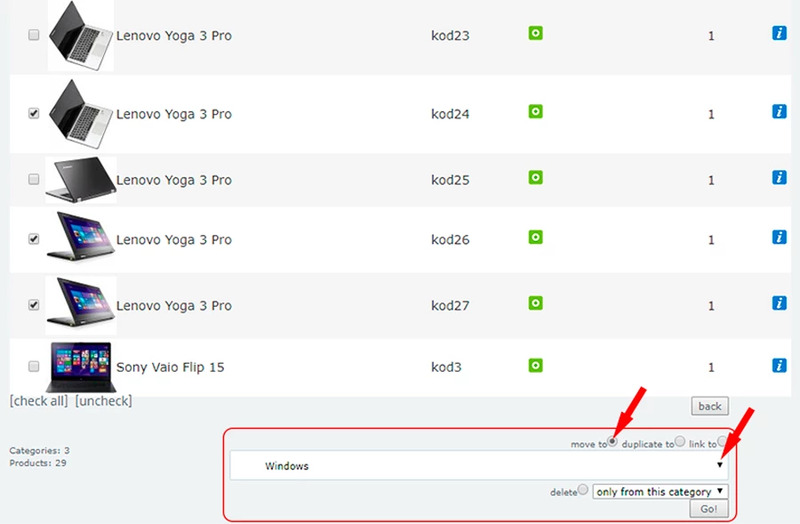 In the appeared window to the right, from the drop-down list, we choose in which category it is necessary to transfer this folder. 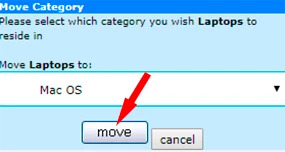 After selecting the folder, press the "Move" button. All is ready, the folder is moved. 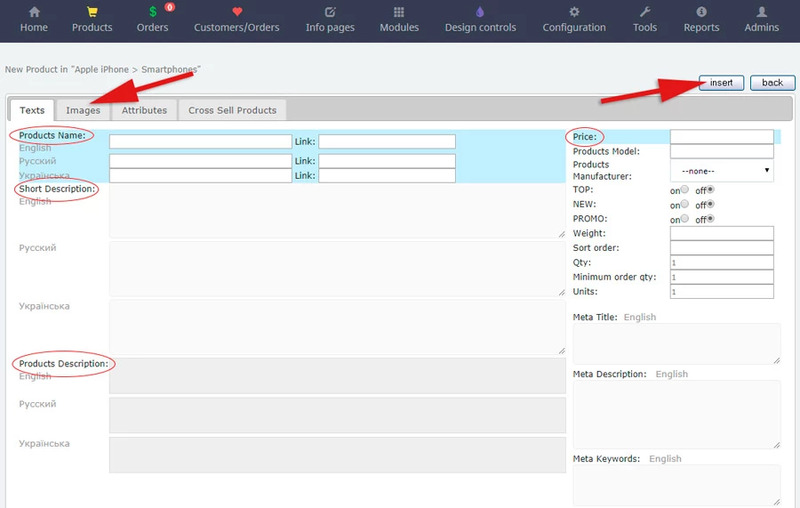 In order to transfer directly the goods or several goods, you need to go through "Products / Multiedit products" and click on the necessary folder with the goods. In the opened folder, select the goods you want to transfer, duplicate, make a link or delete. We go down to the bottom, from the drop-down list choose the category in which we will move the goods. Next, choose the action we need (in this case, moving, and also you can choose to duplicate the goods, make a link to the product or delete) and press the "Go" button. All selected items are transferred. 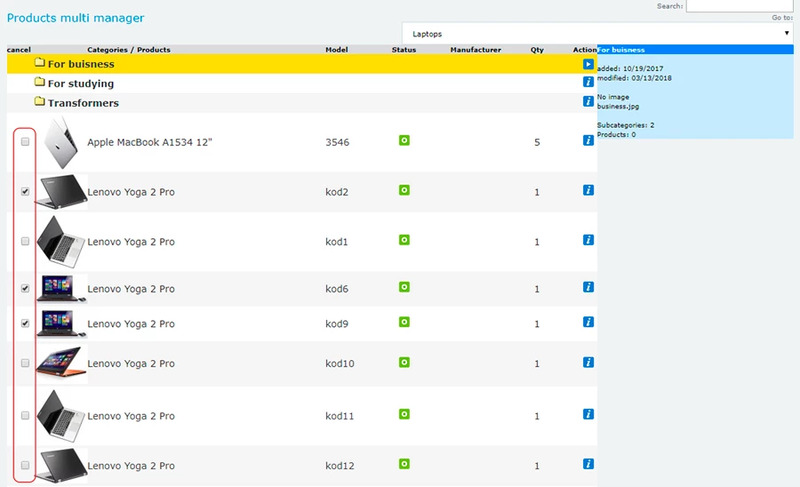 Continuing to fill in the product card, go to the "Attributes" tab. So, we need to add attributes to the product. For example, take Apple iPhone 8 Plus. We already have such attributes as "Diagonal", "OS" and "Display", add "Memory". To do this, we need to open the "Attributes" tab and click "New attribute", and from the drop-down list of attributes select "Memory". Next, from the "Value" drop-down list, select "64Gb". "Prefix", "Price" this time leave unchanged, click "Add". 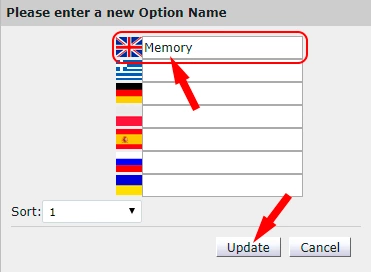 Let's say we do not have the "Memory" attribute in the drop-down list, then we'll create it. 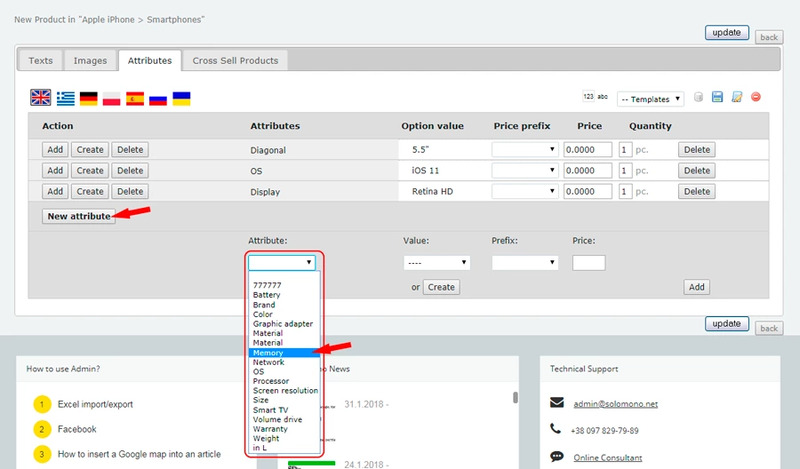 For this, we click on the "New Attribute" and the "Create" button under the "Attribute", (do not touch the drop-down list). Here we enter the name of the attribute "Memory" and click "Update". Now we have a new attribute and if you reuse this attribute, it will already be in the drop-down list. Similar actions we need to do so that to create a new attribute "Memory", add its value. For this, we press the "Create" button but now under the "Memory" label, (we do not touch the drop-down list). Another situation, we need to add another value "128Gb" to the already existing attribute "Memory". 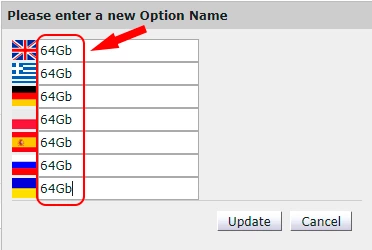 To do this, to the left of the "Memory" attribute, click on the "Add" button and select the necessary value "128Gb" from the drop-down list and click the "OK" button. 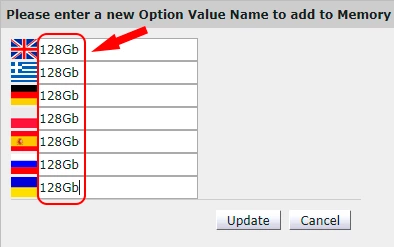 If, in the drop-down list, there is no necessary value for us, then instead of the "Add" button, click "Create" and in the new window that opens, enter what we need. Since the cost of a phone with 128Gb memory is higher than with 64Gb memory, we need to somehow label it. 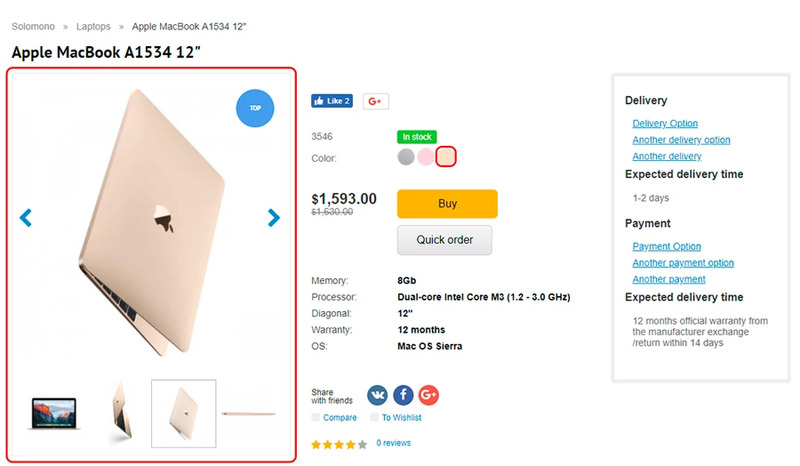 Example: a phone with 128Gb of memory costs $25 more expensive than a phone with 64Gb, respectively, in the column "Price prefix" we put "+", and in the column "Price" we specify 25 and press the button "Update"
If we need to specify the cost of "equal" or "lower" respectively in the "Price prefix", select "=" or "-".